A hybrid bank and slum rehabilitation project in Chembur, which illustrates the use of Development Control Rule 33 (10), 2014. Photo: Vineet Diwadkar. 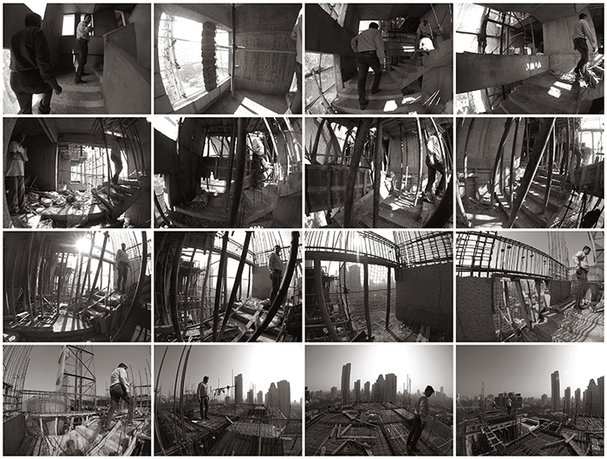 Modeling Mumbai is a research project combining ethnography, video documentation, and graphic visualization of the processes underlying Mumbai's contemporary urban form. Since the 1990s, urbanism in Mumbai has been marked by a simultaneous rise of informal settlement alongside the growth of a high-rise city and its infrastructure. During this period, new development control regulations have introduced a unique algorithm for remaking the built environment. These regulations incentivize private developers to develop low-cost housing for slum-dwellers in exchange for access to the land occupied by vulnerable and marginalized citizens. This schema of privatization, converting slum-dweller resettlement into an architectural currency, has enabled the addition of millions of square feet to the city's built stock, radically altering the city's physical and cultural form. 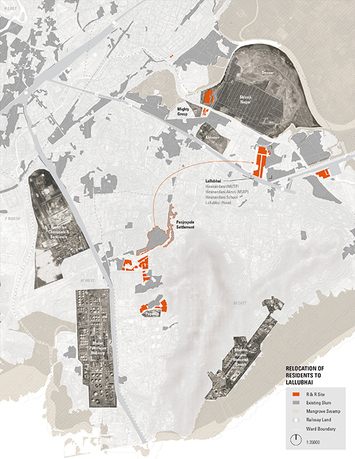 This project offers a visualization of the process and explores its political and cultural consequences as the model is adopted by other rapidly growing cities in India. Vyjayanthi Rao is assistant professor of anthropology at the New School for Social Research, New York. Previously, she held positions at Yale University and at the University of Chicago, where she received her PhD in sociocultural anthropology. For three years, she served as codirector of PUKAR (Partners for Urban Knowledge, Action, and Research), an innovative urban think-tank based in Mumbai. Rao works on cities after globalization, specifically on the intersections of urban planning, design art, violence, and speculation in the articulation of the contemporary global city. She is the author of numerous articles on these topics, which have appeared in Public Culture, New Literary History, Perspecta, and Editoriale Lotus. Her edited volume Speculation, Now: Essays and Artworks, produced in partnership with Carin Kuoni, director of the Vera List Center for Art and Politics at The New School, and graphic designer Prem Krishnamurthi, is forthcoming from Duke University Press. Her monograph on Mumbai, Speculative City: Infrastructure and Complexity in Global Mumbai, is under review. Two new book projects are in development—How to Read a Bomb: Urban Battlefields in the Twenty-First Century and Mumbai Model: Slum Generated City. Her work has been supported by grants from the American Institute of Indian Studies, the Ford Foundation, the MacArthur Foundation, and the New School.